If you're like me and probably the rest of the world, you're shocked from this evening's announcement of the untimely death of Michael Jackson. 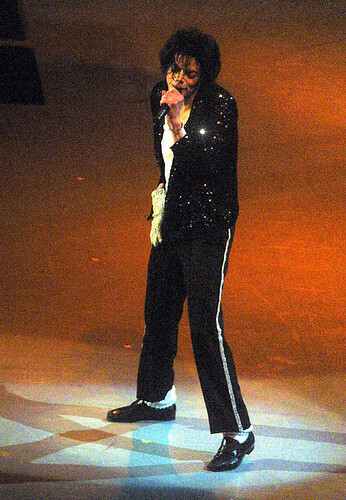 So fast how it happened too--I read Jackson was rushed to the hospital and less than an hour later at my evening Spinning class, a friend rushed into class and asked, "Did you hear that Michael Jackson died?" Between Ed McMahon, Farrah Fawcett and Michael Jackson, it's been a sad week for Hollywood and pop culture, and they all contained their own sense of shock value. But commentary aside, it hit me during spin class to add a post about Michael Jackson hits (and maybe misses depending on how you look at it) to work out to. I'll be the first to admit his songs repeatedly land on my iPod--and I'll take it one step further and say that I ran my second marathon, first with a Walkman in hand, with a collection of Jackson through the years along with Bon Jovi, Bruce Springsteen and some Blink 182 (for some angry running, as I like to call it). Something about those Jackson tunes made it easy for me to crank out those long miles while I was both singing along and reminiscing about my five-year-old self trying to moonwalk across the living room. And well, I just thought they were plain good at making those miles disappear.